What would you guess it takes to be hired at Google? A computer science degree? Academic prowess? The ability to arrive quickly and confidently at the right answer to a question? “One of the things we’ve seen from all our data crunching is that G.P.A.’s are worthless as a criteria for hiring, and test scores are worthless — no correlation at all except for brand-new college grads, where there’s a slight correlation,” said senior vice president for people operations Laszlo Bock in an interview with Adam Bryant of the New York Times. What’s more, the kind of “tests” hiring teams now use in interviews focus on behavior, not knowledge. But aren’t we all trained in school, from an early age, to be able to demonstrate our competence by arriving at the right answer to a tricky question? Don’t the standards of the classroom prepare us for the standards of the real world? Hold on. In every high-performing nation, standardized tests are embedded in the wiring of schools, particularly in high schools. In the developed world, 76 percent of students attend high schools that use them, according to the OECD. Granted, each country uses a slightly different system. In West Germany, for instance, education is the responsibility of the states, rather than the national government. Standardized tests are not used on a population-wide basis, and the use of standardized tests is largely restricted to counseling centers and similar specialists in the schools. Why would so many societies be using standardized tests if they didn’t predict anything important? Daniel Koretz, a scholar in educational measurement, has been studying standardized testing models for over two decades. “Standardized tests as we currently have them are enormously useful,” Koretz says. “Anyone who follows education knows that there are enormous inequities in American schooling. One of the ways we know this is because of standardized tests. In the United States, where K-12 standardized testing has become a multi-billion-dollar industry, highly regarded and national institutions and associations such as the National Board on Educational Testing and Public Policy and the American Educational Research Association have been writing for decades about the pitfalls of both standardized testing in general and the over-reliance on standardized testing, especially in using these tests to make high-stakes decisions about things like high school graduation and teacher evaluation. Finland uses a standardized testing system, but more effectively than most countries. Finnish high school seniors are required to take a standardized, national matriculation exam that determines their chances of attending a Finnish university. The exam stretches out over three grueling weeks and takes about 43 hours. Whereas in the United States, tests have greater consequences for teachers and administrators than for students, in Finland, the students are the ones who feel the pressure. Tests are hard, and they affect students’ lives. The same is true in South Korea, the other top-performing nation on international tests. But is creating a better test really the answer? Maybe it’s not the Finnish testing system that makes a difference but the selectivity of its teacher-preparation programs. And even if it is the Finnish testing system, who’s to say that what’s being tested is what students will actually need to succeed in their careers? Even if every student in the developed world aced his or her college entrance exams, would they be able to land a job at Google? McDonald’s, even? Because today’s job landscape is changing so fast, and because high-paying, middle-skilled vocations are fewer and father between, it is absolutely imperative for young professionals to be able to solve problems creatively and think critically. The capacity to innovate, Wagner says, is far more important than academic knowledge. But how do you measure innovation? How do you set standards for it, define it, teach it? Can it become part of each school system’s curriculum the way that reading, math, and writing are? It’s too bad we were all too busy filling in bubbles on test sheets to hone our creative skills, or else we might just be able to think of an answer. And when she says “cheating,” Ripley is hardly referring to the students themselves. She’s referring to school systems, policymakers, and anyone else who cheats students out of opportunities for success by maintaining the status quo. Schools and districts across the United States have been caught cheating— changing test answers or giving their students test problems ahead of time— including Atlanta, Philadelphia, Washington, D.C., and Texas. A March, 2011 USA Today investigation showed that the dramatic rise in D.C. test scores was due to cheating, not to effective administration. There have also been instances in which tests were scored incorrectly, failing and sending students who had actually passed the tests to summer school. In October 2010, the Chicago Tribune reported that when Illinois adjusted the ISAT scoring system in 2006, it “lowered the number of points required to pass,” resulting in more students appearing proficient than was actually the case. A recent study by the Chicago Consortium on School Research found that, after controlling for differences in assessments and changing demographics, there was essentially no increase in scores of elementary students over two decades of test-driven reform. If the tests we use to measure student learning are themselves invalid, then the inferences we draw and the direction we derive from them are inherently misleading. “What you know matters far less than what you can do with what you know,” says Tony Wagner. Because knowledge is available on every Internet-connected device, and instant answers can be found on Google, tests that focus on content knowledge—the tests most often and easily standardized— disengage and, ultimately, disadvantage students. Look at Google’s hiring team. Why should we continue to emphasize content knowledge when employers aren’t asking for it? But don’t count on students to stand out if they are constantly being trained to fit in. In her book Now You See It, Cathy Davidson points to the similarity between standardized tests and the “assembly line model,” effectively placing kids inside a one-fits-all educational mold and labeling low-scoring students as failures. 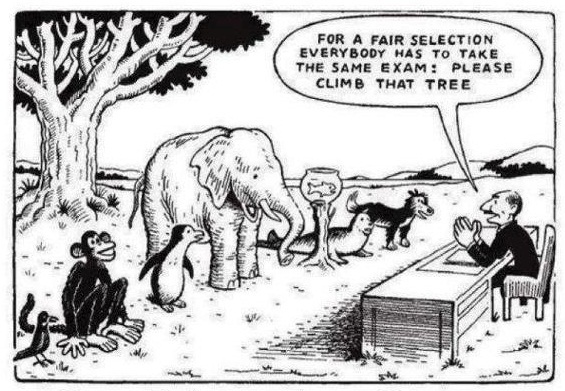 When students are already wired, as humans, to compare themselves to others, it only exacerbates the situation when their basis for comparison is designed to put some of them at a disadvantage. Standardization may enable consistent measurement, but it creates a nasty byproduct in the process: a consistently distorted self-image. Students who ace tests internalize their performance as self-worth, and students who fail tests (and see others succeeding) internalize their performance as self-worthlessness. This trend can last throughout an entire educational career—or lack thereof. A Harvard University study found that standardized testing actually increases the drop-out rate. Students in the bottom 10 percent of achievement were 33 percent more likely to drop out of school in states with graduation tests. The National Research Council found that low-performing elementary and secondary school students who are held back do less well academically, are much worse off socially, and are far likelier to drop out than equally weak students who are promoted. The simple act of writing your name on a test sheet is like signing your life away. Because standardized tests are, by definition, meant to be administered, scored, and interpreted in a standardized and consistent manner, they ignore differences in student learning style and background. This is perhaps the least remediable aspect of the tests, and for that reason the most harmful. While not all standardized tests use multiple choice questions—many are actually performance or project based—they are designed to judge all students using the same set of criteria. And while this is completely necessary for efficient grading, it does not take into account individual variances in learning style or background, and teaches students to follow guidelines more than it teaches them to think outside the box. As schools struggle to avoid the “underperforming” label, entire subject areas—such as music, art, social studies, and foreign languages—are de-emphasized. What is not tested does not count, and 85 percent of teachers believe that their school gives less attention to subjects that are not on the state test. One teacher had this to say about how the timing of state tests drives teaching: “At our school, third- and fourth-grade teachers are told not to teach social studies and science until March.” As “real learning” takes a backseat to “test learning,” challenging curriculum is replaced by multiple choice materials, individualized student learning projects disappear, and in-depth exploration of subjects along with extracurricular activities are squeezed out of the curriculum. Koretz says that while in some nations like the Netherlands, it’s routine for schools to be visited by outside inspectors who look at far more than test scores (and, in fact, the Dutch public often hears about test scores in the context of an inspector’s report), in the United States we don’t measure and tweak. We realize, in hindsight, that a policy didn’t work, leaving many classes of students behind in the process. To get hired at Google, Microsoft, BBC News, Peking University, the Commonwealth Bank of Australia, St. Mary’s Hospital, the International Grocer’s Association, even the local burger joint—or to invent a new job in ten years— students need to spend more time using their skills than measuring them. Sorry, this sounds like a cop out from teachers who can’t teach today’s problem youth percentage. I believe an employee has to man up to the bosses’ requests, just as they man up to standardised curriculum’s requests. With the mobility of people today, standardized curriculum means children who move, (a large percent of student population) will not be retaught stuff they’ve taken then miss stuff gone by. Every student will receive the same material at the same time, therefor guaranteeing that a standard school year, wherever they are is fulfilling. It also leans into progress, as if all courses are taught online, standardized, the teachers will have their time opened up for the slow learners. Standardized online courses means exceptional learners can take more and more varied courses. You can’t be serious with your one size fits all mentality. What this article explains very clearly is that individuals count, cultural shifts count, geolocation counts, not the herding of kids and turning them into sheeple that governments can control more readily than those who are creative, those that can identify problems and ask why, those that will use their imagination and challenge the status quo. The opening paragraph defines the whole article, so your response is the cop out. Must be one of those sitting on the money pile of Common Core and testing, and more testing, and testing until the V1.2 of sheeple are created, types. Note to Author: A great article that hits all the points of a failing education system that is killing our kids and opening the door for global competitors who are not. Peter, I agree! I have seen how standardized tests have made students “shut down”. They gave my son an entire week of them at one time. Of course his scores weren’t indicative of what he can do. He would get in the car after school every day looking like a zombie. You have taken the easy way out. This leads to complacency and even though the evidence is pouring in aids nothing changing. 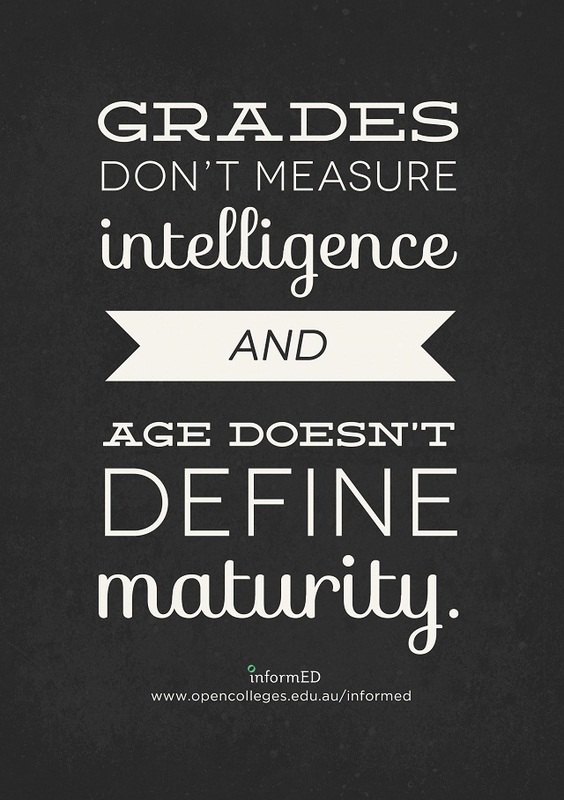 Testing should be to inform not to grade. What you ‘believe’ is not relevant. Belief can be irrational as well as rational. Robots do not make for a better society. 2) learn to know how to reduce it. Schooling may stop, learning should not. Sounds sound to me. So, we shouldn’t be robots. It seems no matter what, you are not going to make everyone happy. The important thing is like said to recognize your ignorance and learn to make the best choice at the time. I wonder, with cutting edge research, if you can ever test for skills at that. So many people who come up with new ideas are way out there and unique, so it is less important for them to follow the traditional track. With the rest of us, we need structure. Like Janet said, there is something to be said about manning up to an employer’s demands. Let’s not forget, many people in the past with college degrees had troubles getting on the career paths they wanted. You bring up a good point, that some students need structure. But I’m afraid that the reason they need structure is because it’s all they know. Certainly, you can’t make everyone happy, but you can open a new generation up to the possibility of independent, divergent thinking–something today’s STs largely ignore. I am not against data driven instruction when it is reliable, varied, fair, and reasonable. What worries me is the Walmartization of education where children are reduced to numbers on a spreadsheet. The academic success of a child or teacher cannot be reduced to a number. I am vexed when we use standardized testing with myopic zeal when it is historically riddled with racism and inequity. Thanks for your comment, Katie. “Myopic” is a perfect word, because it reflects the irony of the whole situation: big data, narrow view. I agree data driven instruction can be useful, but not when we are using the same measurements that created the problem in the first place. Standardized testing should only be used as a diagnostic tool to measure what students know and what skills need to be taught and reviewed. Punishing schools, teachers, students, et al, for poor performance on tests serves no one. Instead, resources (in addition to money and time) should be directed to those who are underperforming to close gaps. Is it any wonder that schools with a lower average socioeconomic status generally are behind those with higher SES figures? Bryan, exactly. It seems hypocritical to place all the blame on schools and teachers when they’re just doing what they’ve been told. And those gaps will continue to grow if our attitude toward measurement remains the same. I don’t agree that we should be teaching kids to look everything up. We already took a giant leap backward in knowledge transmission and memory recall when we went from oral culture to written culture. (Think Library of Alexandria. Could that loss of information have happened in an oral culture, short of massacring everyone in the social group?) Now we don’t expect kids to hold *any* knowledge in their heads, so they will be prey to any demagogue who comes along with an agenda. Which was already a problem with print material, it’s true, but it will be worse now. And by the way? Education is not for getting a job. You mean vo-tech training. And there’s nothing wrong with vo-tech training, but it’s ridiculous to infer that a person must be imprisoned in a compulsory school for thirteen years to get a job. It doesn’t take that long to train for a job. We had better have kids in school for some other purpose, like learning to think in an ordered way, or else we’re wasting all this money for nothing. Thanks for your comment. We all need a base of knowledge. I would never propose otherwise. What I argue here is that knowledge is no longer enough, and our assessment tools haven’t yet caught up. We aspire to whatever we measure, which, in today’s world, is content knowledge. This needs to change if students hope to have successful careers. I am not talking about vocational training; I’m talking about divergent thinking skills, critical reasoning, and collaboration skills… tools that future generations will need to land even the lowest-paying jobs. I love this article and wish every parent and administrator could read it. As a parent of bright boys, who process information in an out-of-the-box way, I see the struggles students face. We are taking very capable kids and turning them into robots. We aren’t teaching basic life skills or independent thinking. We are messing with their confidence with standardized tests that is putting misguided pressure on them. Thank you for this article. I was so happy to see that someone understands what our system is doing. High schools do not get students ready for the college life ahead of them. Standardized tests, like you said, do not teach kids useful life skills and can cause negative affects, such as low self esteem and unnecessary competition to see who got the better scores or who just memorized the most material and did not actually learn and obtain it for the future. These tests are very basic and do not use any creativity, since there is only one specific answer and timed, so it can also cause a lot of stress. The positive with these tests is that schools get funding, which goes back to getting better classroom materials and a better learning environment. Overall, I think that the negatives outweigh the positives and the tests can be carried out in a better way for the kids taking them. Standardized tests are normed-referenced tests. They’re designed to measure large groups against each other – period. The problems began when around 25 years ago districts started to pressure individual schools regarding their results, and then the schools pressured the teachers, and the teachers the students. The results of this are a sickening distortion of schooling and a diminishment of educational possibilities, as districts, schools and teachers focus on competitive test taking rather than the development of fully-functioning lifelong learners and critical thinkers. Standardized testing hurts the overall quality of education if it is the only way to measure student knowledge, assess teacher qualification, and determine school funding. Tests that are administered once a year do not accurately reflect students’ knowledge of the material learned over the course of four quarters, because multiple external factors can have serious negative effects on a student’s performance on that one day. Despite the possible good intentions of the government to improve student performance locally and internationally, as well as bring teachers to responsibility for low assessment results and reduce learning gap between students of different socio-economic backgrounds, the plan did not fulfill public expectations. Mandatory high-stake testing has been severely criticized by educators and parents, and rightfully so. 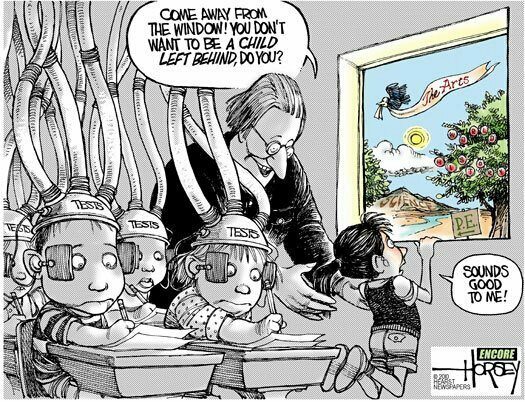 Since the annual government-mandated testing was implemented in the frame of No Child Left Behind Act in 2002, schools have narrowed their curriculum to only reflect the material that is present on tests, while cutting on subjects like science, foreign languages, or arts. Teachers report spending up to 110 hours a year preparing students for tests through drills and test-related strategies. Despite the efforts that are put on achieving high scores, student performance did not improve nationwide, and dropped on the international arena. In addition, many talented educators have left or are considering leaving the profession due to unbearable pressure or unrealistic expectations from the government. Currently, teacher effectiveness is measured by a single test in the end of the year, while the consequences of that test are life-changing: teacher’s salary or even their job depends on the test scores. Moreover, school funding is also at stake if a school is labeled “underperforming” based on these tests. Unfortunately, end-of-year tests are highly unreliable. Many good students opt out of the tests, while many low-income students perform worse than what they are capable of due to external factors. Also, the tests are mandatory for everyone, including students with disabilities and non-native speakers, which also significantly skews the results. However, teachers are judged and schools are penalized for statistics, and not for the actual knowledge students receive. And lastly, standardized tests in their current form do not adequately measure student performance. Bubble tests are designed to assess superficial knowledge, where students do not have to engage in high-level critical thinking or express other cognitive abilities, such as creativity or analytical problem-solving. Tests do not even provide feedback that could be used to help individual students. Portfolio-based assessment, where students are scored based on multiple assignments and activities throughout the year, would give a far more complete picture of students’ intelligence and promote love for learning in both students and teachers. To sum up, standardized testing might be a convenient tool to keep basic track of student progress. However, it does not accurately reflect student knowledge, nor does it improve the country’s performance locally or internationally. Moreover, it restricts teachers in their methods and approaches in classroom, and forces them to narrow the curriculum and teach to test. And the biggest failure of the standardized testing is that it widened the learning gap between students of different socio-economic backgrounds, unfairly penalized “underperforming” schools and teachers, and drives many great educators away from the industry. I definitely agree that standardized tests in school are used for funding and assess teacher qualification. High schoolers and sometimes even college students do not actually study for these tests, they just do anything to try and memorize the information, such as cheating or not retaining the material. This does not do anything for the student because after the test, all of the class material is lost from their brain and not used again. High stake tests can negatively affect students’ self esteem because it does not directly show how smart that student is or how much they know. If schools have to have them, the teachers should make sure students are fully prepared to take it well enough where it should not hurt their grade or how they perceive themselves.